When my son's girlfriend asked me to teach her how to tat, she told me she was somewhat intimidated because the things I tatted looked so great. I replied that I don't exactly brag about the mistakes I made. I've never taken pictures of my disasters, but I did blog a little about my problems making the black floral necklace with turquoise beads. So, for Emily's sake, I rounded up some of my little embarrassments. In the center left is a variegated pink motif I tatted years ago and messed up the count completely. I had several motifs done and the mistakes in them kept me from being able to connect them properly, but I couldn't bear to throw them away either. Next to that motif are a few pieces from playing around with necklace closures on recent projects. 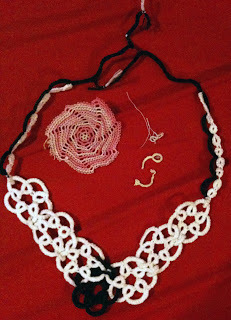 The black and white necklace seemed like it worked, but would never lay correctly when worn. 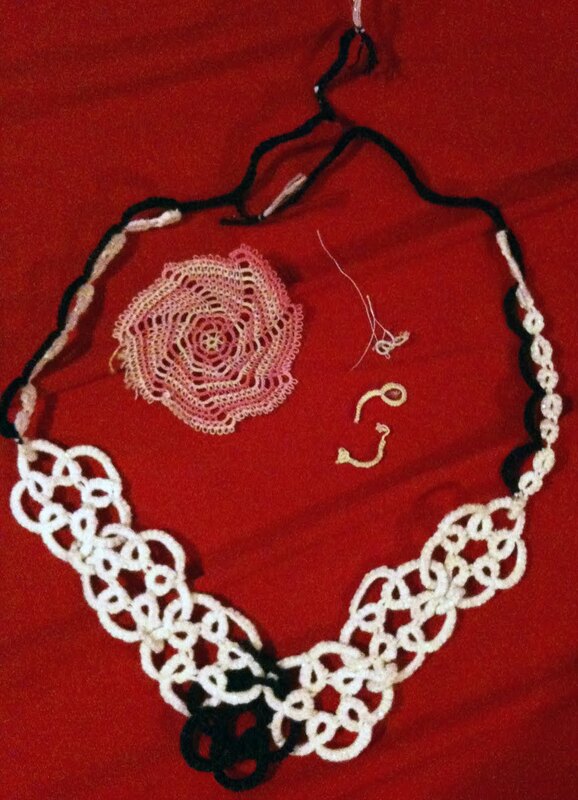 I've tried all kinds of things to fix it, including threading a ribbon through the middle of the necklace and tatting little rings to loop the flowers together so they wouldn't flip over. So far, no good. As a beginner, I made all the same mistakes nearly every beginner does. I stumbled across a blog tonight that made me smile. It's called Craft Fail and it invites crafters to post their failed projects. Never fear, my friends, there is comfort in showing this kind of misery! The most painful one I have found involves ruining beautiful Pendleton wool. There's also a blog called Mighty Ugly where people try to make their crafts ugly on purpose. For the really adventurous (Don't say I didn't warn you! ), visit Regretsy to see the most bizarre items found on Etsy. Lots of mature content/language here, however. Not only will you see items for sale that you think couldn't possibly sell, but they also tell you when those weird things sell. They also feature horrible product photos and stupid product descriptions. As long as your items never end up on Regretsy, you know you haven't hit rock bottom! A fellow tatter featured her "practice pieces" in a blog post and followed with several posts showing how she was able to use them for other projects. I really liked her positive spin and I'm going to start calling my pieces "practice pieces" since I definitely learn a lot about working a pattern from the mistakes I make, even though I have to start over. My husband is Navajo and his people usually work an intentional mistake into the rugs they weave since only God is perfect and they believe the mistake in the rug prevents their spirit from being trapped in the rug. So when you're feeling down about learning a new craft or just having one of those days where things aren't working right, remember that nobody's perfect (except the Big Guy, of course). Everyone who makes mistakes,,realize they are human after all. Keeping practice pieces allows you to see the problem so it's easier to work it out how you want it to be. Plus you can make things with them. So keep them & don't feel bad. Yes, GrandFather is the only true one who can make things perfect! We can only make them close. Due to we are only human. So smile & be proud cause even those who have tatted much longer than me, still make mistakes from time to time. I make mistakes alot too. But I keep at it until I figure out & do it the way I want it to be. Which makes even more pratice piecse to use later in other things. So smile! Thank you for your encouragement. I loved how you turned those practice pieces into great decorations. I make glass beads and I keep my duds or my "beads gone bad" in a big jar. Anyone who wants a handful can help themselves. I'm surprised that people actually do want them and can sometimes make something pretty cool with them. Gen, that's a great idea! I really like the "beads gone bad" title, too. One of my disasters in cooking was some overcooked dinner rolls for Thanksgiving and it became such a family joke that we Modge Podged one of the rolls and put a magnet on the bottom of it and my mother-in-law still has it on her refrigerator all these years later. What a great lesson that most of us have to learn over and over. It's okay to not be perfect -- we aren't meant to be yet. Off to check out some of those fun links you included. Have a great weekend. i've heard a similar attitude in quilting circles, especially in the really old quilts. they would intentionally make a mistake...put a square turned the wrong way...b/c only God is perfect. love the concept! encourages humility for us! not a common trait these days (i'm referring to my lifetime! ).